By Lancaster Against Pipelines, We Are Lancaster County. Our message was simple and direct: we the people, whose lives and land are under assault by this toxic pipeline, openly defy the “right” of dirty energy giants to profit at the expense of our health, safety, water, and land. Check out our Facebook Live video here. 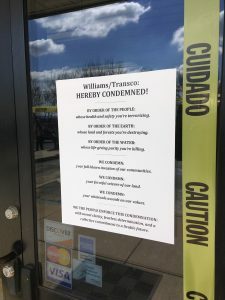 From there, the bus headed down to southern Lancaster County where Williams is drilling under the Conestoga River and desecrating federally recognized indigenous graves. The HDD process they’re using is the same one now contaminating drinking water along the Mariner East 2 pipeline. We walked off the bus and sang our way straight onto that worksite, right past the workers, and up onto the drill rig itself. After police arrived, five bold residents locked arms and stood atop that monstrous machinery for another three hours, shutting down operations for the rest of the day. By day’s end, the Drill Rig Five were arrested while defending our community. It’s a perversion of justice that law enforcement are used to protect the financial interests of energy giants in Oklahoma over the health and safety of local residents. We look forward to the day when fossil fuel billionaires are stuffed into police cruisers for sabotaging our children’s future, rather than those of us peacefully working to protect that future. Yesterday made one thing crystal clear: local communities are done waiting around for regulators, legislators, judges, and law enforcement to protect our most basic rights— pure water, healthy soil, clean air, and safe communities. 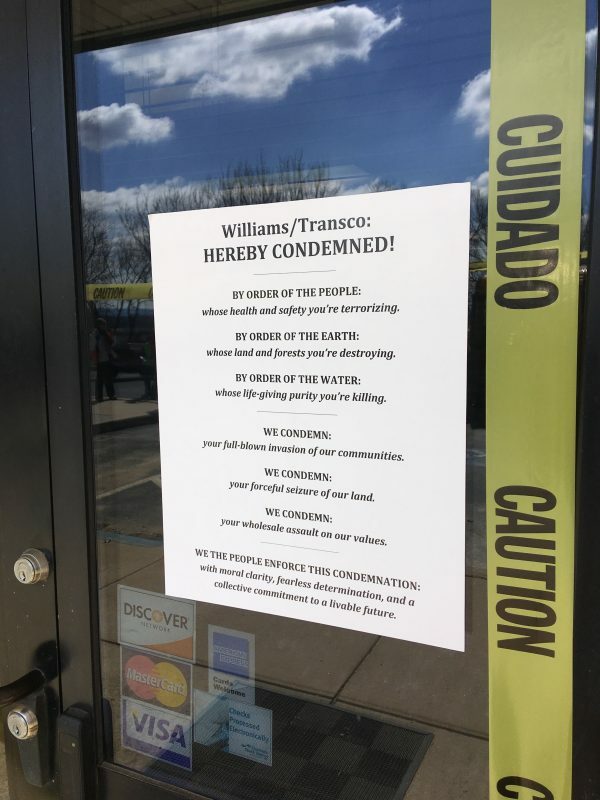 Until it’s illegal for dirty energy giants like Williams to seize farmland and force explosive pipelines next to our children’s schools, we’ll keep walking onto their destruction sites, dropping pipes in their corporate offices, and singing songs of defiance right onto their deathly drill rigs. Momentum is shifting, and the industry knows it. That’s why they’re so desperate—and why we need to be more resolved than ever. And the march goes on!